※This event was closed in success. Thank you for your participation. "Watching eyes: to see and to be seen"
Human social interaction is guided by a complex system of perceptual and higher-level cognitive, affective, and motivational processes. One essential perceptual cue in regulating interaction between individuals is gaze direction. Gaze conveys information about the direction of attention. A person gazing towards another person signals that his or her attention is directed to that person. The observer of another’s direct gaze, in turn, perceives to be a target of another’s attention. In my presentation, I will describe behavioural and psychophysiological studies showing the effects of another’s direct gaze on an observer’s attention and affective responses. I will present evidence that the effects of seeing another’s direct gaze are based not (only) on perception of the visual stimulus of ‘direct gaze’, but rather they reflect the observer’s attributions of being a target to another’s attention and the possibility for reciprocal interaction. Announcement from Prof. Kameda of The University of Tokyo. A German Post Doc from Göttingen University will have self-introduction talk as follows; He will be staying in my labo till March 2nd. No prior registration required. Please join us! Male competition is an important influence on the distribution of resources, such as mates, food or territory, and has been shown to be more strongly implicated, compared to female mate choice, in sexual selection on men. In two studies, the role of different facets of men’s personality, sexually dimorphic traits and hormones in competitive behaviour and sexual selection was investigated. Firstly, increases in the hormone testosterone (T) have been found after intrasexual competitions and exposure to females. Such T reactivity may also affect relevant personality state changes that are observable to others, whereby exact associations, also under potential buffering effects of Cortisol (C), are unclear. In a preregistered study, we aimed at inducing T increases in young men (N=165) through dyadic intrasexual competitions while exposed to a female experimenter. We investigated self-reported and video-based observer-rated personality state changes, as captured by the Interpersonal Circumplex and social impressions, in relation to hormonal levels. Results revealed increases in competitiveness, dominance and self-assurance, relative to a control group and moderated by T reactivity and partly by TxC interactions. This provides further insights into how hormonal and personality responses to challenges are intertwined in men, and partly supports a role of T in mediating a life history trade-off between mating/competing and parenting, as well as signalling dominance to rivals and potential mates. Secondly, in the same sample of men, we sought to provide further evidence on the effects of men’s physical dominance and sexual attractiveness on mating success and hence in sexual selection. Objective measures and subjective ratings of male sexually dimorphic traits (height, vocal and facial masculinity, upper body size from 3D scans, physical strength, and baseline testosterone) and observer perceptions of physical dominance and sexual attractiveness were assessed and associated with mating success in a partly longitudinal design. Results revealed that physical dominance, but not sexual attractiveness, predicted mating success. Physical dominance mediated associations of upper body size, physical strength, as well as vocal and facial physical dominance and attractiveness with mating success. These findings thus suggest a greater importance of intrasexual competition than female choice in human male sexual selection. No registration in advance and no entry fee is required. Please come and join us! * The presentation slides (PowerPoint) are in English while talk is in Japanese. I will talk about three topics: future, present, and the past of electroencephalogram (EEG) research. In the first part, I will talk about the future of EEG and electrocorticogram (ECoG) studies from the viewpoint of brain-computer interface (BCI) application. I will introduce a concept, tentatively called “Makoto’s pessimism”, by showing my preliminary observation that dimension reduction using principal component analysis (PCA) to keep 95% of data variance produced only 9/256 dimensions for EEG but as many as 78/137 for ECoG. I will raise a fundamental skepticism whether scalp EEG has sufficient degrees of freedom to represent complexity of mind. In the second part, I will talk about the present of EEG research. I will first briefly introduce an example of the advanced signal processing on EEG including independent component analysis (ICA) and Multivariate Autoregressive (MVAR) modeling. Next, I will discuss the “Vacation of the ground truth” in EEG research as a fundamental limitation. Although in MRI CuSO4 solution can serve as a ground truth, no simple solution is available for EEG. According to SPM website, fMRI has been used as ‘X-ray of the experimental effect of interest’; EEG has been used as a ‘neural correlate’ to serve a psychologists’ box models as biophysical independent variable whose generative mechanism is unknown/uncared. Because of this limitation, there is always circularity between assumptions of EEG analyses and interpretation of the results, and an issue of relativism across analysis methods and models which produce incommensurability (e.g. what does EEG fractal analysis mean to ERP researchers?) I will mention the current EEG situation as “Adolesc-i-ence”, which means immature and still growing. I will discuss confusion between good science and good engineering, and absence of ground truth cannot be and should not be substituted by signal processing. In the third part, I will talk about the past of EEG research from my school (i.e., UCSD and/or Scott Makeig). I will discuss that EEG has served to a box model. I will introduce a concept “One-bit information generator”, a device that gives yes-or-no answer to a proposed hypothesis in an experiment. However, using this logic as Popperian Defense, the same analysis routine has been used over half a century in EEG research. I will criticize this situation as evolutionary cul-de-sac, and to overcome it I will emphasize importance of engineering in EEG research. I will introduce ICA, and will discuss how it should relate to the ground truth of EEG -- its specific strengths as well as weaknesses. Makoto Miyakoshi is an assistant project scientist in Swartz Center for Computational Neuroscience (SCCN), Institute for Neural Computation, University of California San Diego. He received Bachelor’s degree in Philosophy in Waseda University in 2003 (mentor Teruhisa Tajima), Master’s degree and PhD in Psychology in Nagoya University in 2005 and 2011 respectively (mentor Hideki Ohira). After working at National Center for Geriatrics and Gerontology between 2008 and 2011 using MRI (mentor Toshiharu Nakai), he moved with his family to San Diego and started post-doc researcher in computational neuroscience laboratory using EEG until 2017 (mentor Scott Makeig). His main research fields are signal processing for EEG analysis and clinical applications. He is an associate developer of EEGLAB, the most widely used free open-source software library in the field. "Developmental role of oxytocin on social behaviors in mice"
"Oxytocin, maternal behavior, and synaptic plasticity"
"Social-context dependent oxytocin control on prefrontal cortex"
"Ventral CA1 neurons store social memory"
"Oxytocin and vasopressin affect different behaviors through their actions in the CA2 hippocampal area"
"Brain and Social Mind - The Origin of Empathy and Morality"
"Evolutional and Neural basis of Morality"
"Human Morality: Features and Bugs"
in designing our future social institutions"
We are looking forward to your participation!! 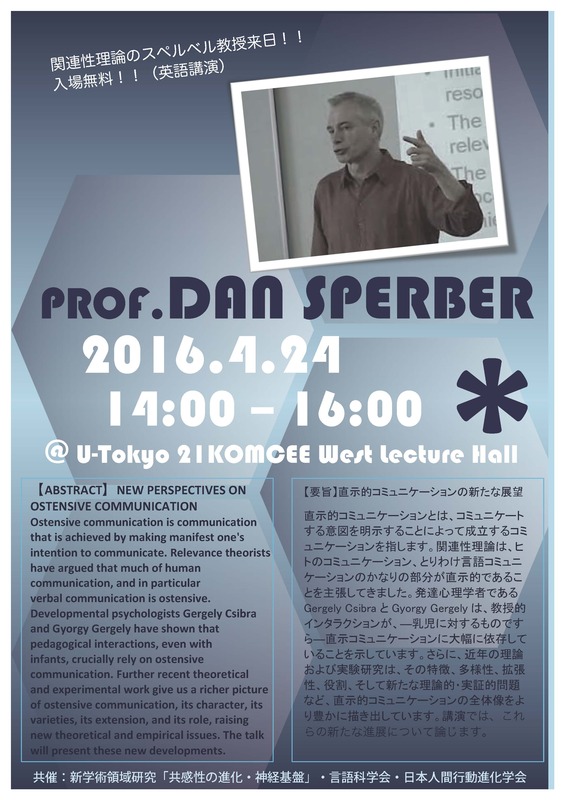 "Special Lecture of Prof. Dan Sperber"
"Opening remarks/Outline of Empathetic Systems"
"NEW PERSPECTIVES ON OSTENSIVE COMMUNICATION"
Prof. Sperber is known to all over the world as an advocate of "relevance theory" and "epidemiology of representations theory". Do not miss this rare chance! We look forward to your participation. 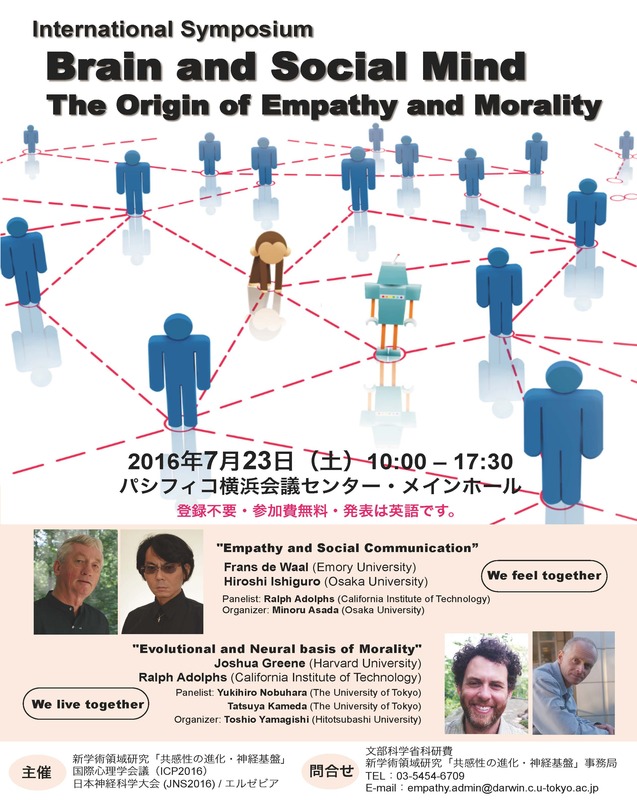 "Neural circuits for empathetic fear learning in mice"
"Evolution of cooperative behavior and fairness in monkeys"
"The brain mechanisms for schadenfreude and fairness in humans"
"Spontaneous theory of mind and its absence in autism spectrum disorders"
Venue：Inuyama International Sightseeing Center "FREUD"